A common mistake we’re to make when trying to transpose any Shakespearean expression from Renaissance English to contemporary modern English is to ignore its context and see it in the context of our own time. This often gives rise to charge against Shakespeare of such modern concepts as ‘racism,’ ‘anti-semitism’ or ‘sexism.’ Another complication is that we sometimes forget that Shakespeare never speaks to his audience – it is always one of his characters talking. We have no idea of what Shakespeare thinks about anything: he is essentially an observer of human life, which he reports through the interaction of his characters, and so we see a range of attitudes to and statements about any of the many subjects he addresses in his plays. We see an example of this in The Merchant of Venice. I have seen the text banned for study in an Orthodox Jewish school, dismissed as an anti-semitic play. But to think Shakespeare was antisemetic is absurd. The Christian community in Venice is certainly hostile to Shylock. It is a very dark play in many ways: while on the surface there is joy and love in that community, and solid support for Antonio in his dealings with Shylock, with sympathy for Antonio from the audience, the Christian citizens are a thoroughly cruel and nasty bunch. Shakespeare is depicting both the anger and bitterness of Shylock, which inform his actions, and the over reaction of the Christian community, with an equal hand. The charges of sexism are similar. We see Juliet driven to desperate measures at the hands of the men in Romeo and Juliet and Ophelia driven to suicide in Hamlet in the same way, but we also see Juliet’s extraordinary qualities of strength, determination and an overwhelming capacity for love. In general, Shakespeare’s women are intelligent, strong and compassionate – more so than most of the men in the plays. Translating any seemingly contentious utterance by one of Shakespeare’s characters is made difficult, partly for the above reasons and partly because of the fact that the language of Shakespeare’s plays is compacted into poetry, each utterance inviting several levels of interpretation. To make it even harder each utterance was written four hundred years ago in the context of a society far distant in its concerns from ours. The Duke of Venice’s pronouncement: If virtue no delighted beauty lack/Your son in law is far more fair than black in Othello arouses twentieth and twenty first century sentiments in us in the light of the revolution in race relations that we have seen. Some of the terms that were once used to refer to individuals of Black African origin have become taboo terms – the use of them imprisonable offences in some countries. It is no longer acceptable to use the word ‘black’ in one of its original meanings – villainous, pejorative, demonic, evil, ill intentioned – the opposite of ‘white,’ meaning virtuous, good, holy, well intentioned. Some editors have, for example, gone through children’s books, changing terms like ‘black-hearted’ to something different. At the beginning of Othello we see the hero as a great man who, because of his superior qualities, is the only man for a job that requires those qualities. He is not only a great soldier and leader but he is filled with virtue. All those gathered together to find a solution to the national crisis know that but it is clear that in all their minds is the consciousness of his alien background, starkly obvious in his black skin. As long as he is doing the job it is fine but when he dares to love the daughter of one of them he becomes the target of a ‘racist’ attack by her father. 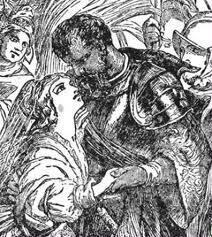 The Duke is a calm, controlled, fair man who does a good job of defusing the immediate tension, although we wonder how he would deal with it if it had been his daughter Othello had chosen to love. His pronouncement, If virtue no delighted beauty lack/Your son in law is far more fair than black is profound and complex. On the surface the words themselves are already in modern English, yet it’s idea cannot be translated into modern English, because of all the difficulties I have outlined. We can understand it as an Elizabethan audience did only if we are able to put ourselves in their place, which we can’t. It plays on all their associations with the words ‘virtue,’ ‘fair’ and ‘black’. The Duke is, indeed, on one level, referring to Othello’s skin colour but Shakespeare, being Shakespeare, is bringing all the audience’s associations with the word into play, most of which are inaccessible to us. i think that Shakespeare had to justify himself in being christian and good at once. whatever he has depicted in his The Merchant of Venice is an effort to do so. Shakespeare but only established belief of his time that is of Christian goodness. Through the aforementioned play only the prevalent racist society is depicted. Although love is a theme that moves and even propels the story but racism dominates after all. It is true that we cannot place ourselves in the mindset and culture context of Elizabethan audience. However, I think we can gain insight into their mindset by what Shakespeare wrote in his plays. We can never accuse Shakespeare of being racist, sexist, etc. since we do not have any evidence to account for this in his person. However, many of his characters are not fantastical but are quite realistic. What I mean by this is that they are based on realistic mindsets, morays, and behaviors that many in his time had. You can glean this from comparing what he says to other literature, letters, etc of the time. And you often find consistent global mindsets about certain things that are characteristic of the time. The truth is that in many ways women were seen as the property of men. That people of color were seen as exotic and often in a pejorative way. And that Jews were not always liked by Christians. These are ugly things but part of the beauty of Shakespeare is that he makes you face these things that even today have great truths to tell about the human condition.